Walking along the statue strewn slopes of Easter Island’s extinct volcano Rano Raraku is a magical, almost spiritual experience. Essentially the main quarry and workshop for the island’s famed statues, it is here the volcanic rock was carved into life by the Polynesian islanders. What remains today is an empty studio of enigmatic statues in various states of progress, almost as if someone blew the quitting time whistle and none of the workers ever returned to complete their sculptures. The feeling of walking amongst the hundreds of heads littering the mountainside is slightly eerie. Isolating even. Statues stand at various angles: some bear down on you as they lean precariously forward while others are content to watch you pass by as they rest against the hillside. Others stand tall while some, still struggling to escape earth’s grasp, are buried up to their ears barely managing to poke their distinctive noses above the ground. Inside the volcano’s caldron more statues perch. 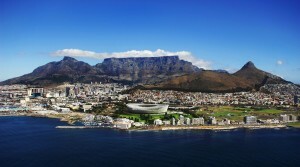 Each looking like a sleeping giant who could at any moment, break free from the mountainside and come to life. It’s a magical electricity which is only rivaled by the mystic blocks of Stonehenge, particularly as the setting sun casts elongated shadows against the rich, green volcanic slope. A tiny speck of land concealed by the vast Pacific, the first thing I noticed after arriving in Rapa Nui is the island’s remoteness. With its nearest neighbour, Pitcairn Island, more than 1900km away and Chile, its parent country, a long five hour flight across the Pacific, its hard to imagine a more isolated but more rewarding tourist destination. The island is small and easily traversed by jeep in a day. In fact, all of Easter Island’s sights can be covered in a compact two days or an easy three. Its triangular shape is the result of converging lava flows from the island’s three extinct volcanoes and it is this fiery heritage that confers the island’s vibrant colours: iron-rich ochre soils supporting fields of crisp, green grass on which wander wild horses under a perfect Pacific blue sky. Paradise? Possibly. But rough and ready Easter Island offers more than South Pacific appeals. It is shrouded in mystery with riddles waiting to be unraveled by would-be anthropologists. 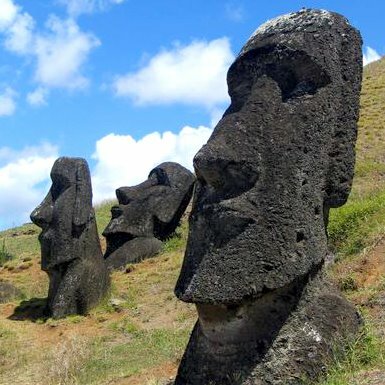 Sculpted from the same volcanic rock that created the island itself, the resident statues or maoi for which the island is renowned, have origins that have never quite been confirmed. Thought to be Polynesian burial markers or perhaps even ancestral images, questions remain to this day on how the impressive 10 metre stone sculptures were transferred from inland quarry to coast. Once at the sea’s edge, they were erected on stone platforms or ahu, their backs mysteriously to the sea, to stand as silent sentinels over their island. Sadly, the coastal statues did not stand the test of time as a tour round the island’s shore shows. Tidal waves have knocked a number of the statues from their pedestals; many have quite literally fallen flat on their faces. Others have not weathered well, their porous stone worn and pockmarked, often rendering them beyond recognition and simply another rock. Thankfully, preservation agencies and interested countries have come to the statues’ aid, repairing and re-erecting them on their platforms. But in some cases, as in one Japanese rebuilt site, the re-erected statues lined in a perfect row come to look almost sterile. The magical electricity is lost. Top Tip: Rent a jeep to tour the rugged roads or tour the island via horseback. To do or not to do? There is no question! 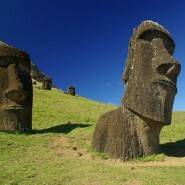 : Easter Island may be in your future travel plans (I certainly hope it is!) but closer to home there’s every opportunity to delve into your local history. Every town has a mystery or two to discover, what’s yours? Where’s your favourite spine-tingling place? Where some deeper, possibly mysterious, meaning shrouds the place.